Looking for a new way to provide commercial solar power energy to your business? Not sure where to start when looking for fossil fuel alternatives? You and thousands of other business owners are looking for ways to cut back their utility bills without causing much of a fuss during the transition whilst also keeping the company in full-swing. Green energy can also reduce carbon emission footprints, which is a huge benefit and positive influence on the world. 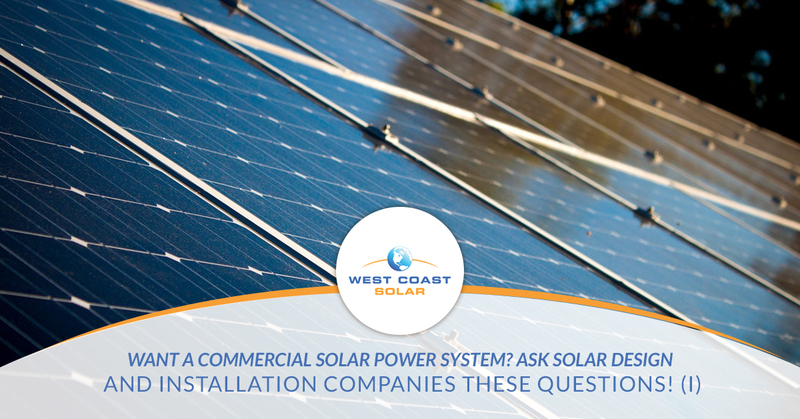 Want to learn the top questions to ask your commercial solar power system provider? Read on to find out in this three-part series! How much can the organization save on a solar power system? Depending on how you want to purchase and install the system, your organization can save a variable amount of money. If your company has the ability to purchase or finance the system, install it on-site, and transfer energy directly into your electrical service panel, you can save quite a bit after the initial investment is paid in full. Although the initial investment may take a few years to pay off, once it is paid off, you will begin to see significant savings on your company’s utility bill. There is also another option that some businesses find attractive: power purchase agreement. In short, you can essentially work with another company that has enough space to invest and build the solar power system on their property, and you agree to buy all the energy or the excess energy from them directly. What this arrangement does is allows for companies that may not have the initial investment or space to house a solar power system as a way to go green. It also brings various companies together in the effort to transition towards renewable energy. Finally, request your solar power installers to run a quote on how much you could save over the span of twenty or so years. Why does this matter? Your investment may take a few years to pay off, which can seem like a hole in your pocket. However, the long term savings heavily outweigh the up front costs of green energy. A quote over the lifespan of a single system (about 20 years) will give you an idea of how much you will save against the cost of the system. How much will the upfront investment be? Let’s start with the common question associated with the question of investment: How much will a solar power system cost? This is a good question, but it doesn’t involve the client’s needs, budget, or power demands. A solar power system is designed based on the three above factors. The cost of a solar panel may vary slightly over a few years, but the needs of any one company is more important in determining how many of those solar panels the client will need. Many companies want to know their options if they decide to invest in a solar power system. If the company is able to purchase the system outright, their capital is going to need to cover the entire purchase. If the company decides to lease the system until they can pay it off, a different amount of capital will be required. What if the company can find a beneficial power purchase agreement? The investment is $0 until their first invoice. Each company’s financial situation and power usage needs are different. This is why a solar power system should be designed specifically for the company looking to invest in their future power consumption. Give West Coast a call for a quote today!